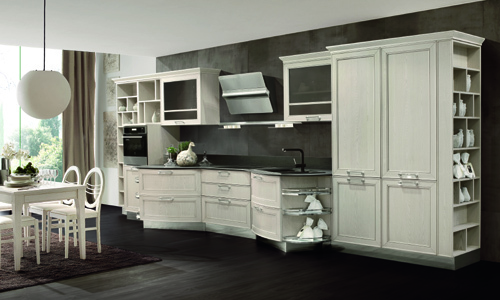 Contemporary Kitchen – York finely-crafted eco-design, recalled in the natural woods and colour finishes. Steel has always been a favourite for cutting edge kitchens; architectural and versatile, this line features the latest contrasting colour trends, bringing new zest into the work space. Colour and simplicity: possible keys to read into everyday life and characterise it with a personal mark that can consist of colours or materials to mix, daring to present the most creative solutions. It was with this idea that the York project was born, featuring traditional and precious forms defined by unusual finishes, united with imagination and an eye for fashion. 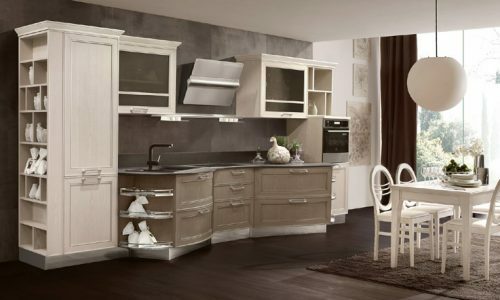 The material appeal of the Rovere Bianco finish, the texture and sense of warmth of the kitchen make this corner composition simple and exclusive at the same time. The kitchen between natural aesthetics and measured technical details. The elegance of the cream finish with soft, poetic combinations, an essential design which positions all the elements in geometric arrangements. Quality and formal exclusiveness and Bianco Artic with Rovere Calce contamination interpret the characteristic visual lightness, in a perfect balance between shades and textures.